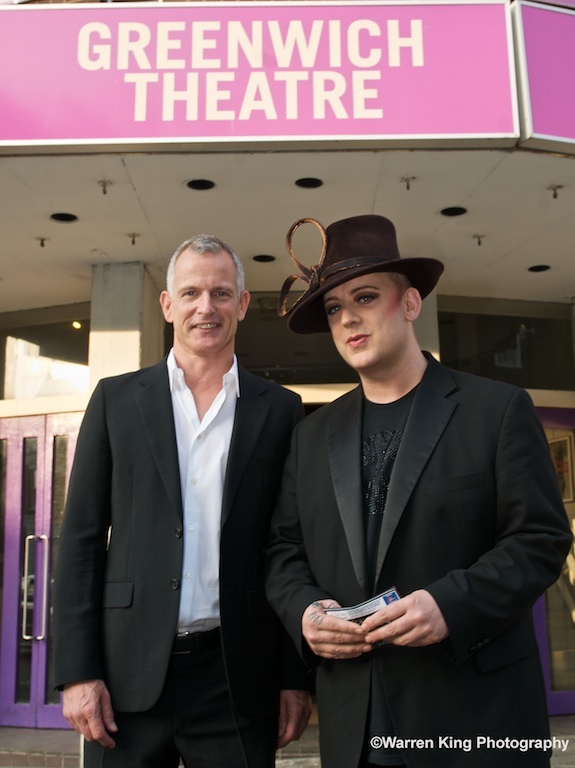 Thanks to Warren King for this photo of Brian Paddick and Boy George outside Greenwich Theatre. The two appeared in an on-stage discussion after the performance of The Temperamentals. Warren comments, "I nearly messed it up when Boy George turned up and stormed inside after I 'papped' him getting out of the cab. After some persuasion he came out for the publicity shots. I apologised and he was very accommodating. Happy ending!" Hold onto your hats, Boy George is coming to Greenwich Theatre. He’ll be attending the off-Broadway hit The Temperamentals on 2 June and will take part in an on-stage discussion after the show. 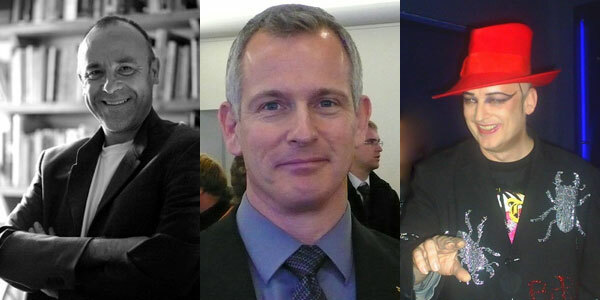 Also taking part will be former top London policeman Brian Paddick and playwright and screenwriter Patrick Wilde. The play’s director, local Greenwich boy Joseph C Walsh, will have the job of keeping everything in order, or not. Set in late 1940s America, The Temperamentals tells the story of two men – communist Harry Hay and Austrian refugee and designer Rudi Gernreich – who together set up the Mattachine Society, the world’s first gay rights organisation. The story explores this “relatively unknown” chapter in history – a time when being gay was illegal and often dangerous. It is the second time in a year that Joe has brought an award-winning show back to Greenwich Theatre. He wowed audiences last year with From Laramie With Love, a tale about the murdered US teen Matthew Shepard. We interviewed him back then here. This time he hopes to do the same. The Temperamentals is coming fresh from Ireland where it scooped an award for its run at the International Dublin Gay Theatre Festival earlier this month. “The play marks an important moment for Greenwich Theatre – for the first time we have brought together two of our young supported companies – Wild Oats Productions and City Lights Theatre Company – and pooled the resources of the three companies to create the show. The fine revival of April in Paris, currently playing at Greenwich Theatre, isn’t going to set the world alight, but it will bring the warmest of glows to what is, at the moment, a gloomy old world. The outlook is as bleak now as it was in 1992 when the play was written. The play is set against talk of redundancies, job insecurity, pit closures and lack of money, themes that seem horribly familiar. The outlook is grey, the set’s grey, the costumes are grey – even the tomato sauce bottle fails to provide any splash of colour. Add into the mix a couple who have grown out of love and the play seems an unlikely source of comic entertainment. The only pleasure for the husband and wife trapped in a black and white world comes from the dry, acerbic banter that Bet and Al have honed in the relentless drudgery of their lives. At the start of the play their sharp overlapping dialogue provides the bleakest of humour, neither really listening to each other, and both seeking either the security of the garden shed, or the shoe shop, to hide from each other as their 25 year old marriage disintegrates. A hint of relief comes in the shape of a competition entry, an escape route that Bet dreams of; it is a dream that comes true. John Godber, the director and writer of the play, creates startlingly simple transformations of scenes as the audience effortlessly journeys with Bet and Al towards France after they win the prize of a romantic weekend in Paris. 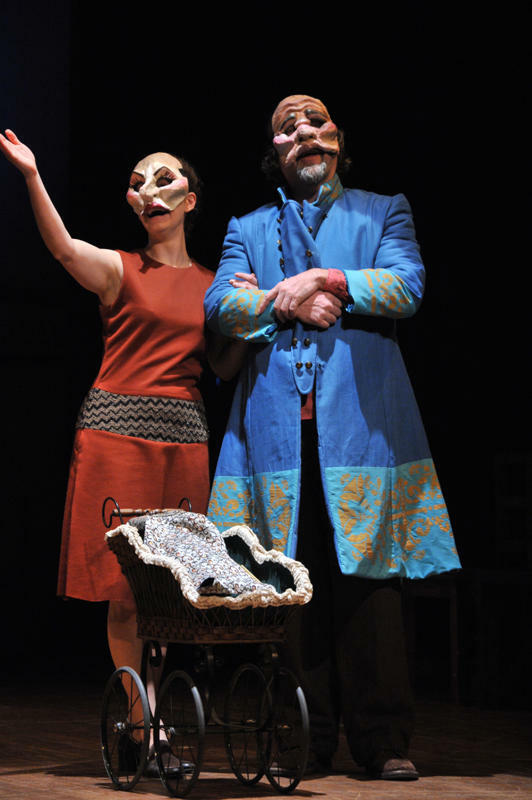 The play literally brightens; colours are introduced into the costume and set as none- too-subtle symbols of Al and Bet’s transforming relationship. The snappy dialogue jokes, that seemed pointed and vicious, become tokens of affection, and the warm glow that I spoke of earlier begins to fire up both the actors and the audience. The second half begins with a dazzling scene change as a new set is revealed, comically echoing the cartoon-like style of the film An American in Paris; perhaps Godber toyed with A Northerner in Paris as an alternative title. Wendi Peters, familiar from Coronation Street, returns to Hull Truck after many years to play the role of Bet. She has a marvellously grumpy expression throughout most of the first act; there is something of Les Dawson about her curled lip and introverted body language. In Paris she transforms herself, blossoming before the audience’s eyes, taking advantage of snatched moments offstage to effect a myriad of small but significant off-stage changes so that, eventually, she flowers in more than one respect. Rob Angell’s changes as Al are rather more subtle. There are fewer evident visual alterations but at the end of the play we see a man who stands taller and who has gained self respect – even if his new found dignity is comically challenged by muggers in the Paris metro. Godber has a romantic sensibility, a belief in the power of humans to transform, and Al’s development as a painter exemplifies this aspect of his work; perhaps it is the latent teacher in Godber that never likes to give up on a lost cause. The pair of actors are pleasingly at home in the play and appear entirely comfortable with the style of the piece, dipping in and out of scenes to share their thoughts with the audience; they act as a perfect foil to one other. Their use of mime can conjure steak tartare out of nothing, and their evident physical skill makes the disco on the P&O ferry one of the funniest scenes in the play. Godber’s theatrical style will come as no surprise to anybody who is familiar with plays such as Up and Under, and Bouncers (Hull Truck’s last play to tour to Greenwich), but it is always a pleasure because it is unfailingly witty and gently humorous. It is a shame that the audience for the show at Greenwich was so small, it deserves better. Godber’s plays are never less than polished entertainment and frequently hold a very large mirror up to the audience so we can reflect on out on lives – in the politest and wittiest way. 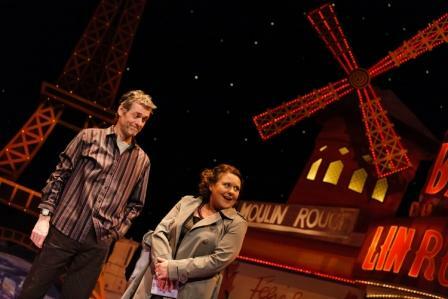 April in Paris continues its run at Greenwich Theatre until Saturday 19th March. The playwright Brecht’s artistic vision was to address issues of huge significance and confront the audience with them – in short, to make the audience think. Blackeyed Theatre’s production of The Caucasian Chalk Circle, currently running at Greenwich theatre, does fulfil this aim successfully and in doing so marries the play’s historical setting with current affairs. Director, Tom Neill, begins by confronting the audience with an energetic debate as villagers aggressively invade the auditorium to argue about land ownership shouting over the audience’s heads; from then on we know we’re going to have to sit up and pay attention. In this moment the ensemble convey successfully the tensions of all land disputes from the neighbour’s fence to the problems in the Middle East. This level of topicality is sustained throughout the evening and the story resonates with the big issues of the day on many levels. Images of today’s politicians, protests and riots are projected onto the walls of the set. I found this quite effective, but at times lost track the thread of the visual argument. The set is simple, yet everything is significant, and there is no starker image than the noose that hangs over the stage. During the play the noose also becomes a mountain and a river across which one of the characters makes a perilous journey. Part of the excitement of the evening was to see how the props that littered the stage were going to be used, and then reused to create a new scene or image. Every element is imaginatively used in a production that is endlessly inventive. The use of a violin as the baby at the centre of the story had a real poignancy, and the fragility of the instrument that, like a baby can scream pretty loudly, was delightful. I did wonder if, as the baby grew, the violin would transform into a viola and cello, and I was rather sad when it didn’t. The ensemble consists of five very talented actors, but on occasion it is stretched to convey the numbers of characters that Brecht creates. This leads to an awkward ending where the child at the centre of the story is literally pulled between his birth mother and foster mother. No matter how inventive the direction there is no getting away from the fact that a good deal of the impact of the moment is lost is having one character play both roles – however true to Brechtian intent the action might be. In other respects Anna Glynn’s performance, the actress who played both parts, was the highlight of the evening. She moved between the grotesque masked character of Natella and the more sympathetic Grusha with real ease. I was moved by the contortion of her body that created, at times, genuine shock and despair. It’s important to say that the evening was also fun – the ballad singing of Paul Taylor held the story together with an easy charm and the musical accompaniment was both witty and had punch. Many of the characters, no matter how grasping or revolting, had a comic sensibility and laughter was not in short supply. As the story developed I felt the pace of the action dipped slightly in the middle of the second half, but I was impressed by the ability of the actors to drive the story forward and it wasn’t long before the two intertwining stories grasped my attention again. ‘The Caucasian Chalk Circle’ is a play of enormous scope and creates a huge vision of the interplay between individual and the state. Blackeyed Theatre’s production is one of the most successful productions of the play that I have seen. It remains true to those elements of theatre practice that Brecht was particularly known for, and as such it was also a real education for the audience and the many students watching. The Caucasian Chalk Circle runs at Greenwich Theatre until Saturday 12th February. Michael Morpurgo wrote Private Peaceful with a mission in mind, that was to help grant posthumous pardons to soldiers shot in the First World War for cowardice; this was, happily, realised in 2006. In Simon Reade’s adaptation the character Private Peaceful too has a mission; to ‘set the record straight’ with regard to his conviction for cowardice. In a play lasting 80 minutes, he does just that – the performance lasts only slightly longer than the court martial that has convicted him. The stage is set without any trappings, just a young man curled up on an old iron bedstead in a barn, awaiting execution by a firing squad. The young man is Private ‘Tommo’ Peaceful, and the play keeps returning to this location as his pocket watch “slowly slides away the seconds” towards the final moments of his life. We experience flashes of his life as Tommo’s story gradually unfolds during the course of the play. There is an inevitability about the structure of the narrative but the trick that is so successfully pulled off is to make the audience care intensely about Tommo’s journey. Mark Quartley, an outstanding young actor at the start of his career, takes on the role of Private Peaceful, and he creates a touching and affecting portrait. During the course of the play he is called upon to create a battalionful of other characters that populate the stage in Tommo’s journey from Devon to the Western front. The performance is energetic, with clear and precise transformations from one character to another, as Quartley effortlessly becomes a young wide eyed-child, a colonel, a schoolteacher and even a cantankerous old woman urging Tommo to join up for the army well before he’s reached the proper age. He has an impressive physical presence and a vocal precision that creates and maintains the audience’s attention. Sound and lighting carefully enhance the simplicity of the play; they are both judiciously used to indicate mood and location. As the play reaches its conclusions key moments are dramatically staged, slow motion is used highly effectively to illustrate the pain of the battlefield and the worthlessness of human life on the Western Front. The narrative is full of carefully woven images that trace Tommo as he grows from a young child in an Edwardian country idyll to the final moments of his life. The mud that young Tommo feels between his toes as a child when he walks excitedly through a stream becomes the gooey mud that “wants to drown you” in the trenches. The thrill of seeing his first aeroplane cutting its way through the Devon sky becomes the smoke-trail of a Royal Flying Corp biplane plunging to the ground over Belgium. The images that are evoked at the start of the play turn to dust as the horrors of war overcome Tommo and his brother Charlie. Simon Reade’s adaptation makes no concessions to children regarding the reality of the battlefield and it has real bite; for the adult it has the simplicity and punch of a well-told parable. However, there is also a lightness of touch that allows the audience to laugh at the world through Tommo’s eyes, even in extremis. Michael Morpurgo’s books about the First World War and its effect on the individual have reached an entire generation of children and their influence grows. As the lavish stage adaptation of War Horse continues to run in the West End and the publicity machine cranks up for Spielberg’s adaptation of it for the big screen, Private Peaceful quietly begins its national tour at Greenwich Theatre. It is worth noting how effective a one man show can be; it is startlingly simple, and surprisingly effective. Private Peaceful is on at Greenwich Theatre until Sat 29th January. Trudging through the snow and ice with the kids makes a pantomime feel particularly special. Perhaps it’s the anticipation of the warm atmosphere inside the theatre, or it might just be memories of being taken to Greenwich Theatre as a kid back in the ‘70s. Cinderella, this year’s Christmas panto doesn’t disappoint, it packs a punch in every department and leaves the audience overflowing with goodwill. It might lack the celebrity touch, but while Hasslehoff swashbuckles in Wimbledon and Melinda Messenger is the genii of Bromley, it is the strength of the ensemble that may make Greenwich’s offering the pick of the bunch. Adam Dougal as Buttons builds a cheeky relationship with the audience, whilst Tania Mathurin, playing the Fairy Godmother, doesn’t have to rely on pyrotechnics to carry her through the show; she has a cracking voice and a presence to match. In fact all the cast are able to carry a song and Steve Marwick’s musical direction shrewdly caters for all age groups with medleys effortlessly merging The Andrews Sisters with the Eurythmics and Tinie Tempah. The show ends with the inevitable sing-along and such was the rapport that the cast had with the audience that I couldn’t see anybody who wasn’t joining in; it would have taken a real grouchnot to have gone along with the crowd. Cinderella and Prince Charlemagne carry the main storyline. In panto these moments often flag as the audience anticipates the arrival of another comic scene, but in this production Hannah Wilding and Luke Kempner keep the momentum of the romantic plot going with good comic timing and help from Tommy Coleman’s strong Dandini. The genre of pantomime requires the director to tread a fine line between polished amateurism and over-produced glitz, and this show not only treads the line but dances along it with glee. The director Kieron Smith keeps a tight reign on the performers, making sure the pace is fast and snappy, always leaving the audience wanting slightly more. The choreography is never too ambitious, but always witty and attractive. Mention should be made of the talented, hardworking and young group of singers and dancers that form the dance ensemble. Constantly energetic, this small group manages to punch well above its weight, creating the sense that there are many more performers than there actually are. 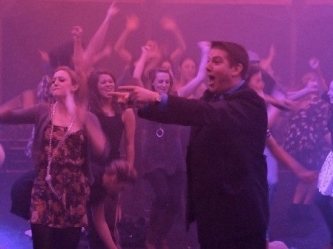 This becomes a great strength as they confidently join in with the fun that the leads are having on stage. The design of the show makes the most of the warmth that can be created in Greenwich Theatre, a proscenium arch, richly painted in gold and apricot colours, brings the actors as close to the audience as possible and makes the most of the stage’s thrust, allowing transformations to be effected through the revolving sets. The show achieves a huge amount with limited resources, so much can be achieved with a couple of mirror balls and a whiff of smoke; there’s something really attractive about a show that relies on the strength of the performers rather than the ‘wow’ of theatrical wizardry. To be frank I wasn’t expecting to enjoy the show as much as I did, and I think that applied to most of the audience. Several hundred audience members got more than their money’s worth and, if you haven’t booked your seat, do so now. The show has already extended its run by 10 days to accommodate record ticket sales. ‘The Laramie Project’ is the result of an imaginative collaboration between Wild Oats Productions and the Greenwich Theatre; it is a moving and challenging piece of drama. The play is a piece of ‘verbatim theatre’ that draws its script from eyewitness accounts of an actual event. This style of theatre can be effective and affecting, and so it proves on this occasion. The actors forensically dissect the circumstances around the brutal murder of Matthew Shepard, and in the process unpick the small town community of Laramie, Wyoming (population 26687), revealing frightening attitudes towards its gay community. The depth of the tragic subject matter might frighten a potential audience off, but the production has an engaging lightness of touch and a keen sense of the human comedy from which hope eventually emerges. The eight members of the ensemble play an extraordinary range of characters, changing role from moment to moment, adopting elements of costume that become key to identifying their characters. Islamic feminists, pastors, bar tenders and doctors emerge from the narrative to give their take on the events before they fade into the background of the story. Director Joseph C. Walsh succeeds in organising the staging effectively, leaving the audience in no doubt as to where their focus should lie. He also uses theatrical trickery to great effect, pulling us into the story and making the connection between the actor and the audience more intense. 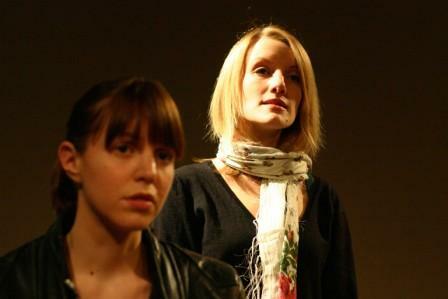 The play successfully relies on the talents of the actors’ characterisations to maintain the pace of the narrative. Throughout there is a tremendous sense of energy on stage and the actors’ commitment to telling Matthew Shepard’s story is apparent, so much so that it almost becomes a mission. It would be difficult not to be deeply moved by the speech that Francis Adams makes, in the role of Shepard’s father, when addressing a court on the question of the death penalty. For a play that is largely based on words there are many highly charged visual images, not least the simple opening image where chairs create the fence where the crime took place, with simple coat pegs loaded with costumes echoing the three crosses of the crucifixion. My only significant reservation about this production is in relation to the decision to have two intervals instead of one, which seemed to unnecessarily disrupt the flow of the piece as we were approaching the finely tuned conclusion. As the evening developed, another piece of verbatim theatre, by the Tricycle Theatre about the murder of Stephen Lawrence, sprang to mind. We have our own hate crimes closer to home and ‘The Laramie Project’ is an important piece of work because, for all its focus on small town America, there are universal truths in this play that give it a direct relevance to our local community. Contact Greenwich Theatre for tickets. ‘Emotionally searing’ The Laramie Project talked to 200 townspeople following Matthew Shepard’s torture and murder in 1998. Joseph C Walsh is the young Greenwich director behind the “searing” Laramie Project coming to Greenwich Theatre later this month. Based on the life and brutal 1998 murder of US student Matthew Shepard, the play’s subject matter – prejudice and homophobia – is still, as illustrated by Greenwich’s very own recent , a hot topic. Greenwich.co.uk spoke to Joe to find out more. Joe, you're bringing the Laramie Project to Greenwich Theatre - your local theatre - later this month. What's the play about? It examines a small town’s reaction to the murder of 21-year-old University of Wyoming student Matthew Shepard in 1998. The original writers of the play travelled to Laramie six times in the 18-months after Shepard’s death and conducted over 200 interviews with people in the community. Those interviews paint a fascinating, sometime funny, incredibly moving and insightful portrait of a town struggling with its own identity and international media scrutiny. So every word in the play is ‘real’? Yes. It’s completely based on interviews with the people of Laramie as well as journal entries and court documents. The play does an incredible job structuring this into a satisfying theatrical event. You've produced it before haven't you? What's the history behind the show? It was premiered in Denver, Colorado in February 2000 and then in New York in May 2000. Since then it’s become one of the most produced plays in the USA and has received productions worldwide including two major London productions. Our production is the first major London outing for the show since 2005. And what’s your relationship with the show? It started in 2000 when I saw the original Off-Broadway Production. To this day it is one of the most powerful, memorable and special experiences I have ever had in the theatre. It became a goal of mine way back then to direct the show and try to share it with as many people as possible. Last year we presented it at The Space in Mudchute and revived it as part of the Dublin International Gay and Lesbian Theatre Festival. We’re thrilled to bring it to Greenwich Theatre – my home theatre. It's been described as a 'must-see' and 'emotionally searing'. Why emotionally searing? Because the audience is aware that every word said on stage came from a real person. The town of Laramie is shown warts and all, and we as an audience are asked to come to our own conclusions about the people and the incidents presented. The subject matter itself is hugely emotive, and the play is so well structured that the audience becomes completely wrapped up in the story-telling. I’m originally from a city called Lynn just outside Boston. I grew up performing and in my teens began directing. Theatre has always been a part of my life. I grew up in a political family and although I didn’t follow directly in their footsteps I feel that my interest in projects like The Laramie Project comes from that background. Is where you are from anything like Laramie? Are you from Smallsville USA? Lynn is a fairly big city, so no. 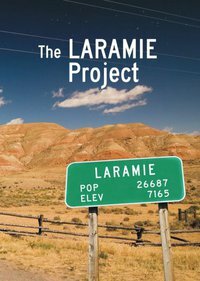 But I think what is amazing about The Laramie Project is that I do see some of where I grew up in it and the people I knew. I think the themes and concerns expressed by the townspeople are universal. How did you end up in London and Greenwich? I moved here eight years ago to do my Master’s Degree in Directing. I’ve lived in and around Greenwich the whole time. And now you work fulltime as a director? At the moment I split my time between freelance directing and education. I’m the musical theatre director in residence for Plumstead Manor, and previously was the head of musical theatre for Greenwich Theatre. As a director, I’ve directed half-a-dozen UK premieres, a couple of Irish premieres, an acclaimed Irish tour of The King and I and a London revival of The Anniversary. In the West End I served as resident director on When Harry Met Sally and Coyote on a Fence. The company returned to Laramie for the 10th Anniversary of Matthew Shepard’s death to see how the town had changed. It seems that many people feel that Matthew’s death opened a dialogue that changed people’s opinions about sexuality. Others think nothing has changed and there are some who try to excuse the entire incident as a robbery gone wrong. I suppose one of the messages from the play is that prejudice and bigotry happens anywhere, and can have dreadful consequences. What do you think then when you see something like the News Shopper letter row, in your own big-city back yard? Well, it’s people like Mrs Fitzsimon’s that make me so proud of the work we are doing with this play. Mrs Fitzsimon is perfectly welcome to her beliefs and opinions, however, it does concern me that this letter may be read by some as a reason to commit violence against members of the gay community – marginalisation and judgement of a minority group plant the seeds of violence. I would very much like to share The Laramie Project with Mrs Fitzsimon and hear her opinions on the Matthew Shepard case. I will try to get in touch with the News Shopper and offer her free tickets to the show. Are you a campaigner at heart? Is that why you've brought this play to the stage? Yes, I think I am. I was brought up in a political family and have always been drawn to theatre with a social conscience. I love the theatre. I love all genre of theatre, and I do think that at the heart of anything you can find a message to share. Can theatre really change the way people think? Or is it usually a case of preaching to the converted? I think great art can change the way people think. When I saw the original production of The Laramie Project there were older women sitting in front of me. At the interval one said she wasn’t enjoying it and wanted to leave. The other convinced her to stay. By the end the one who wanted to leave had to be helped out of the theatre by her friend because she was so moved. It had a profound impact. Living in a place as seemingly open as London it is very easy to forget that people have fought hard and some have lost their lives in order to open up a dialogue about sexuality and all forms of equality. I know your local is the Rose and Crown, next door to the Greenwich Theatre… what are your other local haunts / top tips? Well, there is obviously our gorgeous park, lovely beer gardens and of course Greenwich Theatre and Picture House. I can also guarantee that the Organic Café has the best breakfast in London. And what's next for you? And the Laramie Project? As I said, we’re keen to bring The Laramie Project to a wider audience. We’d love to take it on tour and find a home for a longer run in London. We’re also developing a very exciting schools project for the show, and are hoping to present The Laramie Project: 10 Years Later at Greenwich Theatre in October. Personally I’ve just begun writing a new musical and am going to be touring Germany with a theatre company. Thanks Joe. That’s enough from us. Plug your play in 25 words or less. 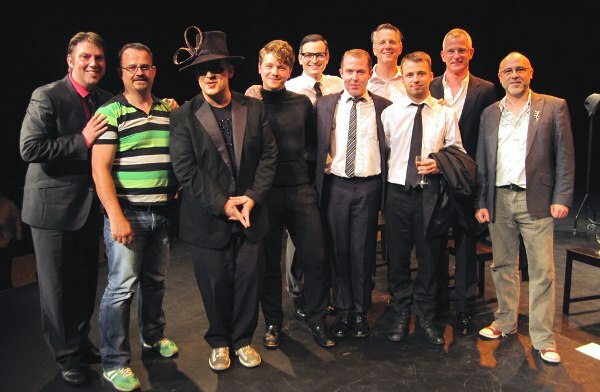 The Laramie Project is an important, entertaining and moving piece of theatre. It will open your mind and make you think about yourself and your community. It is a special piece of theatre that will resonate with everyone, and leave you contemplative and inspired. Oh, that’s 44!